When you send your kids off to school, whether they’re heading to kindergarten or college, the backpack they use can be one of the most important items they take with them. A good backpack should be able to hold all the essentials that a kid needs for class. Some are designed with a padded pocket to keep a laptop or tablet. These work well for high school and college students who need access to their technology. For younger children, you can choose a smaller pack that can hold their books, notebooks, pencils, and other items. 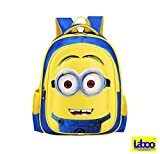 The LABOO Minions Kid Backpack has a roomy main compartment that can be used for books and other school essentials. This bag has a lining that is easy to clean in case your child spills something inside it. The outside zip pocket is ideal for keeping smaller items contained and easily accessible. The backpack also has 2 side pockets for holding drinks or other items. This Minions backpack is designed for children ages 5 and older. It has a durable zipper that is easy to open and close, making it ideal for small hands. This backpack has a breathable back panel and ergonomic shoulder straps for comfort when carrying a heavy load. The Student College backpack is made of waterproof nylon material to help protect your books and other important items from moisture damage. This backpack comes in 3 color options. It has a USB charging function that allows you to charge you phone or other compatible device. 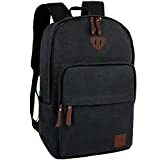 This backpack is capable of carrying everything a high school or college student needs for class. It has a pocket that can fit a laptop up to 15.6″ and an outside pocket for a water bottle or other drink. The bag has two hidden zippered pockets inside to hold a phone or wallet. It also has thickly padded shoulder straps for comfort. The JanSport Right Pack backpack is able to hold a laptop up to 15″. The bag has an internal sleeve that helps protect the laptop or tablet. This bag comes in a large variety of colors and it can be used for children of all grade levels. It has a suede leather bottom that not only looks stylish, but adds an element of durability to the bottom of the bag. 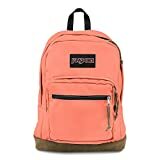 This backpack from JanSport is made with premium fabric that is designed to retain its color and last through heavy duty usage. The padded shoulder straps are adjustable for comfort. The bag has a large main compartment for books and notebooks. Plus, it has a smaller front compartment for other items. The Teecho Cute School Backpack set comes with 3 pieces. Each bag included in the set is made with durable and waterproof polyester. The bags all have smooth zippers and nylon linings. The set includes a backpack, a shoulder bag, and a pencil case. 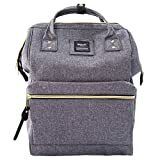 The backpack included in this set has a large main zippered compartment that can be used for books and can also hold a laptop up to 14″. It has an interior zipper pocket that can be used to store items that you want to keep safe like money or your cell phone. The side pocket can be used for holding a water bottle or other drink. The Kids Backpack for girls and boys comes in several cute patterns and designs. This backpack is made of high quality materials that can withstand the wear and tear that comes from being used by active kids. It has a reflective quality on the back for an added safety feature for kids when they are outdoors in low light conditions. This backpack from Delune is waterproof and has durable zippers. The back has a large zippered compartment that has a wide top opening so children can easily get to their books and other items. The bag also has other smaller zippered pockets to keep pencils and other items needed for class. The Delune Girl’s school bag can be used by children from kindergarten through 5th grade. This bag has 3M safety strips on the back for a reflective quality as an added safety measure. 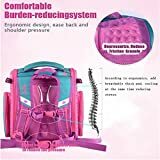 The backpack has comfortable straps and a waist strap that helps to reduce the burden on the back and shoulders when your child has a full backpack. This bag from Delune has a cute puppy design in a pink, purple, and blue color scheme. It comes with a cute doll that can be attached or removed from the bag. The backpack is made from breathable mesh on the back to prevent overheating. The Himawari Travel Backpack comes in many neutral and bright colors. This bag has many uses. It’s ideal for college students who need a lot of space for storing large books and other essential items. It can also be used for travel or as a diaper bag. It has traditional backpack straps and top handles that allow you to carry it different ways. This stylish backpack from Himawari is made of durable 95% waterproof canvas. It can be wiped clean if it gets soiled. It has a doctor bag style opening in the main compartment for easy access. The bag also has a side pocket for keeping a drink and smaller zip pockets for organization. The ZYSUN backpack is available in beige, black, or light green. This lightweight backpack is made of super light materials making it ideal for those who don’t need to carry a lot with them. The bag has a top handle and adjustable shoulder straps. This mini backpack can hold some small books, pens, a tablet, and other items. It has a main zippered compartment and a small front zippered compartment to help keep your stuff organized. The nylon fabric used in the construction of this bag is durable and water-resistant to keep your items safe from damage during inclement weather. The Ibagbar Vintage Canvas backpack has a timeless look. It can be used for school or for travel. This bag is capable of holding your laptop, along with many other items. It has a front zippered pocket that can keep smaller items contained and organized. The interior of the main compartment also has separate pockets for smaller items. This canvas backpack is lightweight but durable. It’s available in several neutral colors. The bag has 2 side pockets for drinks or other small items and a padded laptop sleeve to protect your electronics. The straps are fully adjustable for comfort. The JanSport Big Student Backpack is made of 600 Denier polyester which is durable and designed to withstand heavy duty usage. This bag can be be used for students in elementary school through college as it’s lightweight but can still hold everything needed for class. This backpack from JanSport has s-curve shoulder straps for comfort. They can be adjusted and also have padding for an extra layer of support for the shoulders. The bag has a large main compartment that can be used to hold a laptop, books, and other supplies. It also has several other smaller pockets including a front gear pocket to keep electronics organized. Choosing a backpack can be one of the most important choices a student makes when it comes to school supplies. Students from elementary grades through college need a quality backpack to keep their essential items at hand. 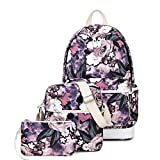 Younger kids may be able to use a smaller backpack that is designed for a smaller load of books and supplies, while high school and college kids probably need a larger bag that can hold their laptop and the collection of books they need for all their classes. 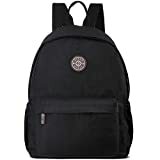 Older students may wish to carry a backpack that has a protective pocket for their laptop or tablet. Backpacks come in a wide variety of colors and patterns. Younger children may want a bag with a favorite character or color while high school or college students may prefer a bag in a neutral color. When choosing a bag you should consider the material it’s made from. Many options are designed to be waterproof or water-resistant to protect the contents of the bag. The amount of pockets on the bag is also important as many pockets and compartments can help with organization if a lot of small items need to be contained in the bag. When shopping for a backpack for school it can be useful to read online reviews to find the best option to fit your needs.